I don't know if you were all aware of this, but it's the FUTURE! 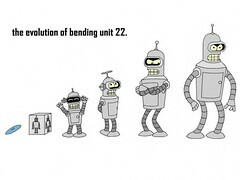 Except I do not have a bending unit robot as a sassy side kick (*YET*). I got my first text from Target for coupons on my iPhone. That's the future, baby. They just scan the barcode on your phone. Here's the link to sign up: Target Phone Coupons. Now if they could just work on getting me a Bending Unit.